Who would’ve guessed that introducing Elle Woods from Legally Blonde, Captain James T. Kirk from 2009’s Star Trek, and Eames from Inception together would have amounted to a fun film such as this? Apparently, director McG (Terminator Salvation, Charlie’s Angels, NBC’s Chuck) did and he did it in a fun way. Starting off with a bang…literally, This Means War starts off with all the excitement and promise of a James Bond/Mission Impossible film with the two best friends and partners Tuck (Hardy) and FDR (Pine) dressed in standard Bond-issue tuxedos and brandishing side-arms that seem to never miss their mark. Confident and unaccustomed to being bested by any enemy, these two are suddenly stopped in their tracks when one Lauren S. (Witherspoon) enters the picture. Lauren: Single and successful. Gorgeous and looking for “Mr. Right.” She ends up dating both of them without knowledge of their connection to each other…and without their knowledge of the other man’s involvement. But spies being spies…information begins to leak and thus the movie’s main plot is born. 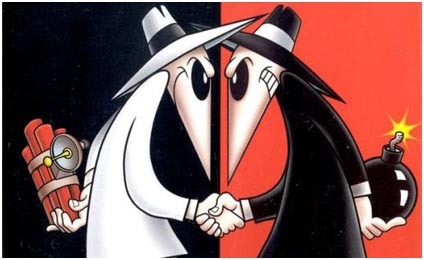 Ah, the classic “Spy vs. Spy!” Impressively, both Tuck and FDR utilize all of their training, skills, and resources in hilarious recon, seek and destroy missions, and infiltration/covert outings…only each of their respective focuses are on the moves of the other spy and Lauren under the pretense of national security. Paintball battles, first date “firsts”, and bad advice-giving friends, surround this hilariously unintentional love triangle of a film but it is loads of fun once you get past the beginning and get straight to the story that counts. This film tries to implement too much with an unnecessary story line of a dangerous international villain that remains on the C.I.A’s top bad guy list. Consequently, feeling the need to tie the film together in this manner, This Means War suffers and goes from being a semi-believable fun rom-com action type film to a “Nope, that would never happen” kind of a film. BUT…it’s still fun and not all that bad. You will laugh quite a bit. And Chris Pine and Tom Hardy really work well together on screen and make up for the sub-par aspects of this post-Valentine’s Day fun flick. I look forward to more films starring these two Hollywood stars. Predictable to the very end. I’ll be interested in if you can pick who gets the girl in the end? Thanks for the heads up on this one, T. Good review. thank YOU sir. It was enjoyable to say the least. a good date movie. Thanks Paula. Highly entertaining this one. so many movies to be catching up on, I know how you feel. Love the review T as always. I am seeing this next week but we have a review in from Teri who went to a press screening of it last week. She was a bit less taken by it than you. thanks for the compliment my friend. I look forward to swooping in on FRC and reading Teri’s review. I trust your weekend is great as well. I’m really relieved it wasn’t horrendous. I used to be a big fan of Reese, but that’s waned big time. Tom Hardy’s the draw for me here. I can deal with it being a fun, if a little over the top. Cheers! I feel the same about Reese. Haven’t been thrilled about too much from here lately. You will enjoy Tom Hardy though. Who knew he could be so funny? I like your poll, T, nice touch! Well you could guess which one I voted for 🙂 I’ll rent this to see more of the inverted bromance of sort between Pine and Hardy, surely they have more chemistry w/ each other than each w/ Reese. Thanks so much! Pine and Hardy really had a good “Bromance” going on! 2.5 is about right, I’ll probably lambscore it a 3. Hooray! We see eye to eye once again. I was impressed with how I enjoyed it despite the obvious flaws. A fun flick for sure! Oh, and on the lamb…I’m prepping for it, Promise. Just been incredibly unbelievably busy these last few days! appreciate the comment. it is rather enjoyable. a whole lot more than expected, that’s for sure! I am just glad I still was able to enjoy this for what it was. There were several moments I laughed out loud. I laughed out loud too! Lol…and left the theatre smiling. So if nothing else, it was definitely an enjoyable movie to watch. quite enjoyable indeed. I always appreciate you stopping in and commenting. Thanks Taj! It’s a fun flick. I laughed more than I expected to. Expect little and Enjoy a Lot.